Want to add a tropical feeling to your yard? 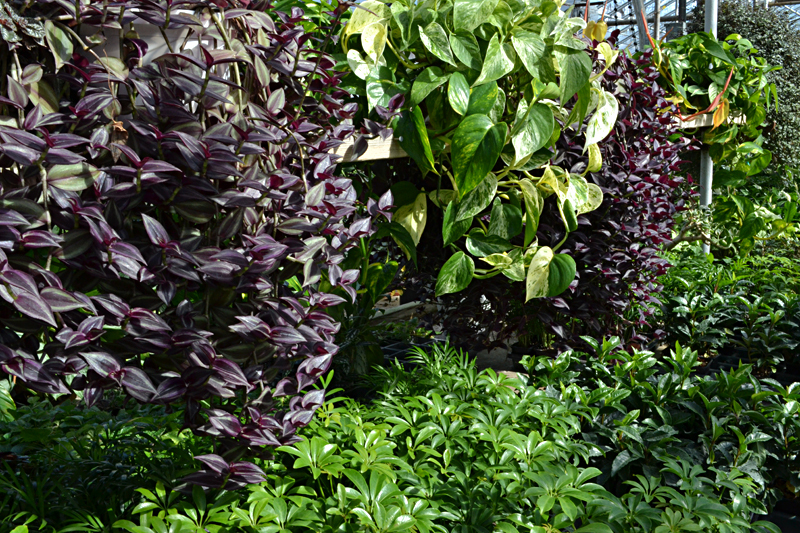 Here are seven plant suggestions from the folks at Mischler’s Florist and Greenhouses, 118 South Forest Road, Williamsville. Check out these plants to add a tropical feeling to your backyard. I mention these plants first because we’re all antsy for anything having to do with gardening. Indoor plants are something you can put your hands on right now at Mischler’s shop or next week at Mischler’s booth at Plantasia. 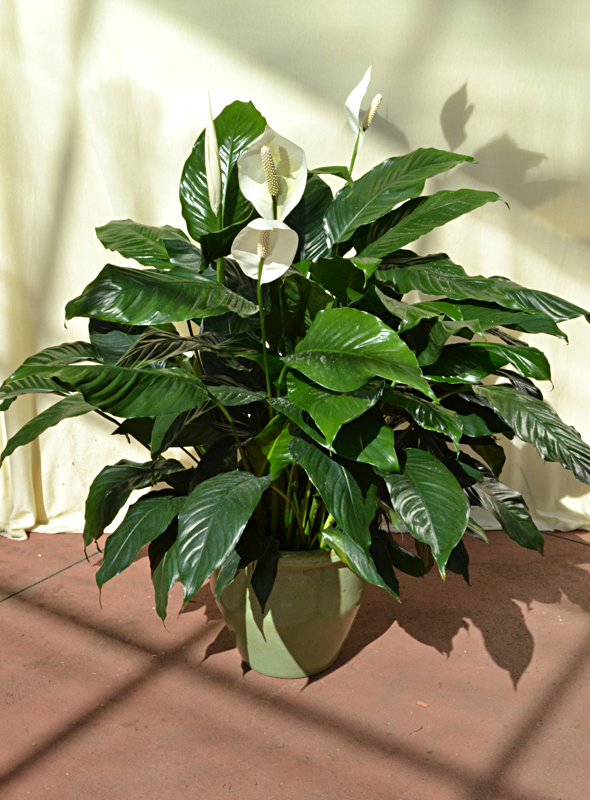 That dramatic red flower above is an anthurium and the white flowers below are peace lilies. In the summer, you can move the plants outdoors. Warning: Don’t put these indoor plants in the sun. I made this mistake and the edges of the leaves quickly turned brown. When I think of the word “tropical,” I think of sandy beaches and lots of sun. But these indoor plants don’t grow on the beach. Their natural habitat is in a tropical forest under a canopy of leaves, explained Frank Mischler, president of Mischler’s. When it’s warm enough to move these tropical plants outside, find protected, shady spots for them such as on a patio under an awning, in a breezeway or in an enclosed porch. It’s best to gradually get them accustomed to being outdoors, Mischler said. The drying wind can give them windburn. You can group several indoor plants in larger container to take outside, added Dan Meyer, greenhouse associate. Combining several plants can make a nice grouping, plus you won’t have to water a large pot as often as you have to water a small pot. You can use common indoor plants such as those above left, too. When you bring your plants back inside for the fall, make sure you look them over for insects and diseases, Meyer said. Look on the undersides of the leaves as well as on tops of the leaves. If you see something that looks like it might be a problem and don’t know what to do, remove an affected leaf, pop it into a plastic bag, seal the bag and take it into Mischler’s. Their experts can help you identify what the problem is and make sure you buy the right product — if you need to use a product at all. Sometimes all you have to do is pluck off the affected leaves, Meyer said. Mischler’s experts can advise you on the right course of action. 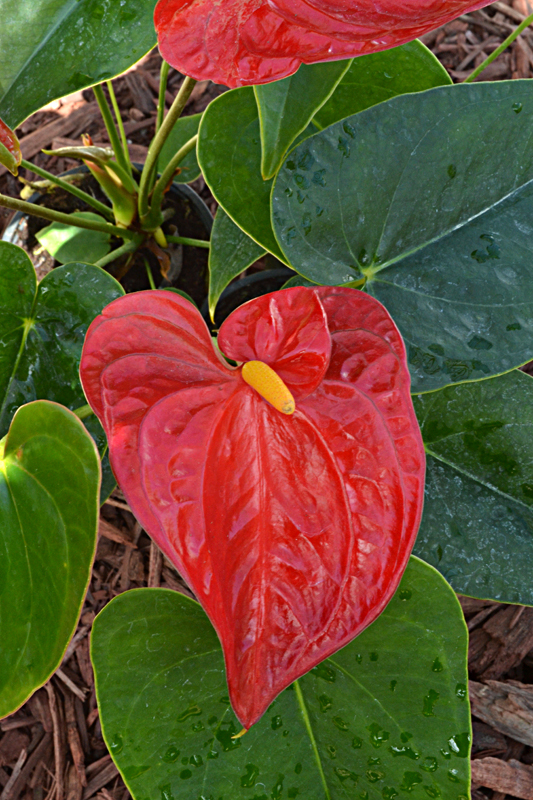 In the tropics, plant and animals grow to giant proportions, and the aptly named elephant ear plant with its colossal leaves helps to create an exotic atmosphere in your yard. 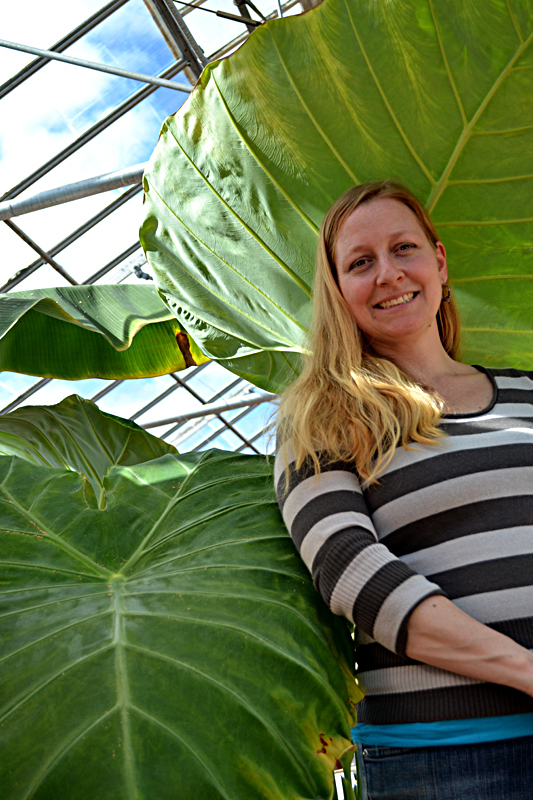 Above, Colleen Morrissey, herb manager and container designer at Mischler’s, could use a single leaf of this ‘Thailand Giant’ as an umbrella. Mischler’s hopes to have ‘Thailand Giant’ bulbs in time for Plantasia. These plants grow outside in part sun to sun. The bulb needs to be brought indoors for the winter. 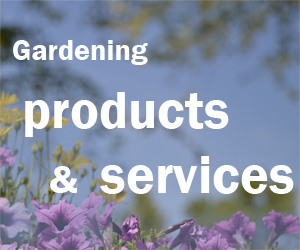 Other varieties will be available as plants at the end of May. 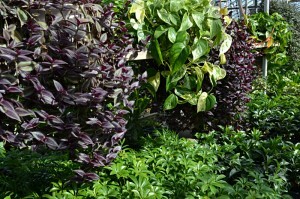 These plants will take up some room in your garden, said Mark Yadon, vice president at Mischler’s. The ‘Thailand Giant’ gets to be 10 feet across, while more upright varieties such as ‘Coffee Cups’ and ‘Black Magic’ will spread about three feet. However, elephant ears doesn’t have to be the only plant in that spot; you can grow things underneath, Yadon said. What’s more tropical than a banana tree? I tried to get a photo of the banana tree at Mischler’s, but it is so big– probably 12 feet tall– that I couldn’t get a good shot. You can see it at Plantasia. 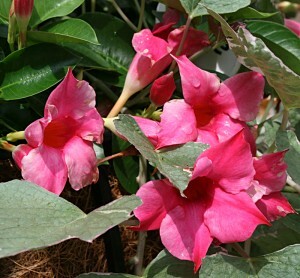 Mandevilla. Photo from Mischler’s Florist and Greenhouses. Banana trees will be available at Mischler’s in May. The plants will be four to six feet tall and can grow six to eight feet more in one year. “They’re fairly rapid growers,” Mischler said. If the leaves get yellow or blemished, cut the leaf off and another will grow rapidly to take its place, Meyer added. One thing you should be aware of is that strong winds could rip the leaves, so you should try to find a protected spot for it. You probably won’t get fruit because you have to take the banana tree inside for the winter. How do you keep a 12-foot tall plant inside your house over the winter? You don’t. The banana tree will send out shoots called pups at the bottom of the plant, Yadon said. When it’s time to bring the plant inside, cut the main stalk off completely about four inches off the ground. The short pups are what you’ll nurture over the winter. This striking flower likes sun. Keep it in well drained soil because it doesn’t like wet feet. Mandevilla is very viney, Meyer said. It will climb up anything: a trellis, the supports of a patio, the branches of a tree or a string. In Western New York, it’s an annual, Mischler said. In the winter, you can bring it inside and keep it in a bright window. Tropical hibiscus. Photo from Mischler’s Florist and Greenhouses. You can find this plant at Mischler’s in May. This is another beautiful flower that likes sun. 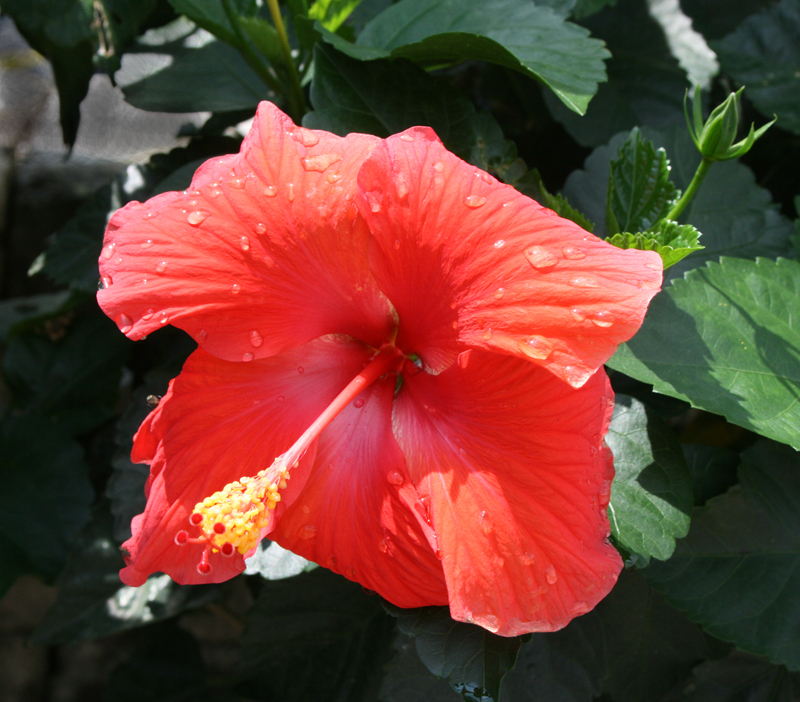 There are two types of hibiscus: perennial and tropical. Mischler’s will carry both in May. The perennial can be planted outside in the ground. It will winter over. It can get huge, 10-inch blossoms the size of dinner plates. They bloom late in the season. The tropical hibiscus should be left in its pot because you need to bring it inside for the winter. The flowers get to be four or five inches across. It blooms throughout the summer. Use these plants in your landscape to create a tropical feeling for your backyard oasis. 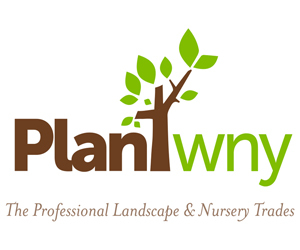 Plantasia to give us a taste of spring in Western New YorkWhat might a new addition to Botanical Gardens look like? All great selections to make a wonderfully designed patio in summer, giving that vacation feel at home. Staycations are the best! Thanks for the comment. When you bring a tropical inside for the winter, should it be pruned back or allowed to shed it’s excess leaves in the winter light? How would you manage the climbing nature of the Mandevilla? When you’re talking about bringing in tropical plants for the winter, do you mean things that we would consider houseplants? I don’t think you should have to trim them back, but I’ll see if someone from Mischler’s can add a comment. They will shed some leaves when brought indoors. Pruning back hibiscus will prevent any chance of blooming until the next spring. Many people dont prune if light is good. To maintain a good shape it should be pruned in the spring. Mandevilla should be pruned when brought in. Our experience is they will bloom late. Prune to 8 inches, and cut back small runners to 8 inches. Thank you Mark. My hibiscus grows a lot in the summer, even indoors. In order to be able to accommodate its size I need to prune That also seems to keep it leafier all along the branches. Blooming is sporadic. I’d like to get it to bloom more. Thanks for the good information. The red anthurium is stunning.